Often the greatest impact we can make in life is through our posterity. Fortune and fame, leadership, education, career, invention, etc etc etc are all wonderful and all contribute but to grant someone life is eternally impactful. To grant many people life and raise them to be good can change the world forever. I learned this lesson through taking on a project to write the bios of all of my grandparents and great-grandparents. As I’ve learned about their lives my perspective about what matters the most has shifted just a little. It has been easier to see the big picture in my own life about what’s important and to let things go that just don’t end up mattering much at all. My mother’s father is one of those people that I’m talking about- one of the ones that gave ME life which is why I will forever love him and feel indebted to him. His name is Leonard. If you met him at the grocery store you would glance at him and then keep looking for tomato paste. He’s just an old man in his 90’s who walks with a cane, likes watching The Price Is Right and lives alone with a cat named Coley. But behind the suspenders and flannel shirt there is a full life. One that has made all the difference for me. Leonard T Taylor was born in the winter of 1927 in Salem, Utah - a tiny town south of Salt Lake City. He was the youngest of 8 children. Leonard’s Dad was a farmer who sharecropped - farming land that he didn’t own. The family made very little money, mostly living off what they farmed and canned. Leonard recalls that life was simple then. People didn't have a lot. The government would bring citrus to Salem because kids were suffering from scurvy- a disease brought on by eating only one kind of food like potatoes for a long time. 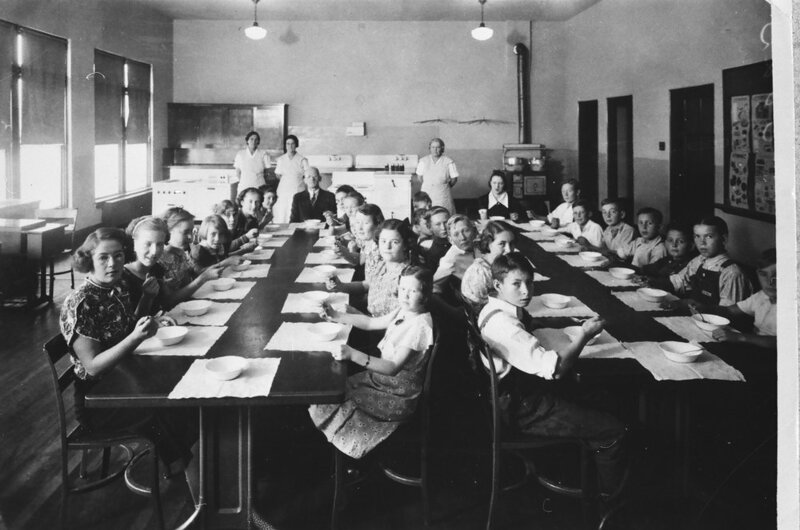 The first hot lunch served at the Salem school to those who didn't have lunch from home. Taken in 1938. My grandpa would've been 11 at the time, although he is not in the picture. Photo source. He has always been very reserved and shy. He tells of being a young boy and if he saw a girl walking down the street he would cross to the other side because he was too afraid to talk to her. When Leonard was around 14 years old his parents moved out of Salem to Salt Lake City. They farmed a piece of land on what is now Wander Lane in Holladay- very near where I currently live. In 1945 when he turned 18 he was immediately drafted to fight in World War ll. Because he was on the latter end of the draft he never had to fight. The war ended at the time that he got on the boat to go to Europe. Instead he was stationed in Italy where they were deployed to help clean up the war and restore peace. While in the rough army environment a lot of the men smoked cigarettes and drank beer because clean water was hard to come by. 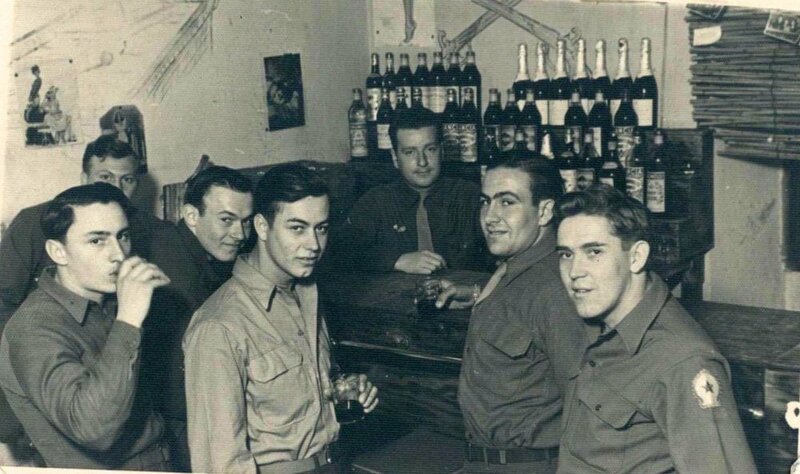 Leonard recalls that on one occasion he tried beer and decided that he would never do so again because it was contrary to what his parents had taught him. Leonard is the one on the right. Upon returning home from the army Leonard married Maxine Clapham in the Salt Lake Temple. They had four kids, two boys and two girls: Calvin, Kim, Julie, and my Mom Janene. He took a job in some of the early days for Purity Biscuit for 5 years, demonstrating his willingness to work hard for his family. He has always loved to garden, even into his 90’s. In raising his family they relied heavily on their garden for their main source of food. Maxine and Leonard had their fair share of heartache. In 1965, the couple had saved up to buy a beautiful piano. The piano finally arrived and they spent the evening playing it and admiring it. That night a cousin Corey, who was over for a sleepover, woke up to the smell of smoke. My Mom who was 6 at the time says that following her Mom out of the smokey house on her hands and knees is her earliest memory. Neighbors and friends stood out on the front lawn with the family that night as they watched their little house and all their earthly possessions go up in flames. At that time the neighborhood rallied around them, holding toy showers and clothes showers for the family. They slowly rebuilt the house and even restored the beautiful piano, which had had it’s keys melted off. In the summer of 1974 a more terrible and lasting tragedy struck the family when 40 year old Maxine began to have headaches. Doctors soon discovered that Maxine had a brain aneurysm and an operation would have to be attempted. Her surgery that July day didn’t go how they’d hoped and Maxine Taylor never came out of the operation. Leonard’s heart was understandably broken. Many years later he recalled that he was completely crushed wondering how he would go on and even momentarily considered taking his own life. Leonard, 9 months after Maxine’s death quickly met and married Alta Wallace. She had been previously married and divorced and had four children of her own. Understandably, the blending of the two families was very difficult for everyone involved. To Leonard’s credit he knew how to be a good husband and was unfailingly loyal to his new wife. Because of this, even through all the turbulence due to the marriage, he was able to maintain a strong relationship with Alta and enjoyed over 40 happy years with her even until her death in 2016. From his four kids he has 18 grandkids, and 31 great-grandchildren and counting. Those great-grandchildren will go on to have children of their own and on and on. 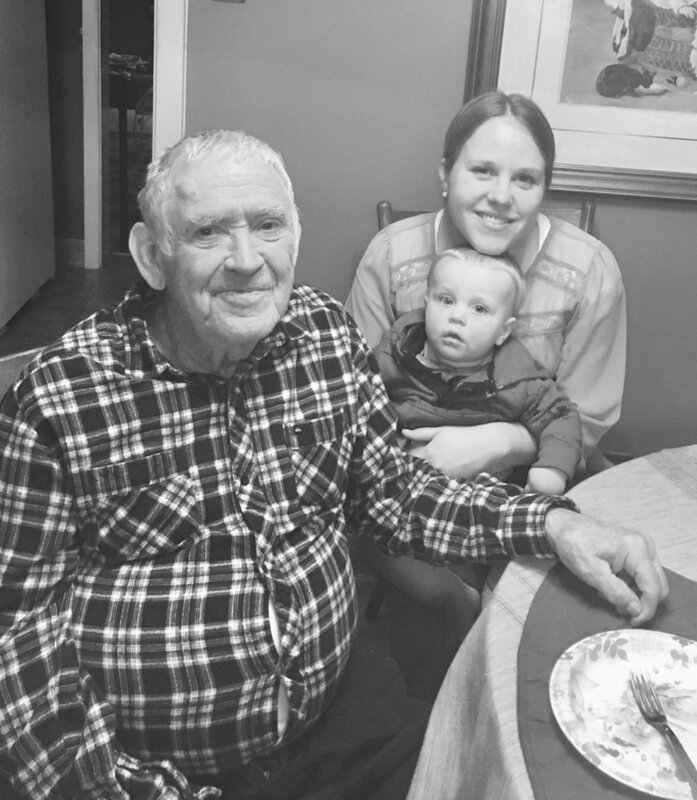 Though his life was comparatively very simple, his devotion to his family and to his children has ended up mattering a great deal. Although he wasn’t perfect some of his best traits have passed on to the next generations. Things like integrity, a can-do attitude and knowing when to quit and enjoy life are manifest in my aunts, uncles and cousins and siblings because of him. His love of gardening has survived. All of my married siblings keep a vegetable garden in their yards because we watched our Mom lovingly tend her garden and grew up on home grown beans and peaches in the summer. Sometimes I look into my Grandpa’s face and wonder how it’s possible that the blood which flows in his veins is also my blood- that I came from him. His life was so different than mine, his personality so unique and yet I truly do carry some of his attributes. It is a great parenting lesson that it’s all worth it in the end and that who we choose to be is not entirely our own. Our decisions can make a bigger difference to other people than just ourselves. My little Cal with Grandpa Taylor. So the next time you’re walking down the canned food aisle and you see an old codger picking out his chicken soup take a longer look. Even better, next Thanksgiving dinner maybe sit next to Grandpa Jones or Aunt Betty and you might find out a thing or two about yourself. I’d love to read your thoughts on the impact your ancestors have had on you in the comments below.